When pop singer Katy Perry married funnyman Russell Brand earlier this fall, it was in a lavish Bollywood-worthy affair. People Magazine reports that pre-wedding events included a safari, shopping spree and several parties in India. You may want not be able to rent out a wildlife reserve on the other side of the world for your nuptials but there are some meaningful ideas that you can take away from Katy Perry and Russell Brand’s this ultimate hook up. You don’t have to completely appropriate this South Asian culture to have a wedding accentuated with Indian elements. 1. Invitations and Ornate Stationery. Invitations, cards, announcements, thank yous and save-the-dates are important to any wedding but Indian weddings have the most incredible stationary. 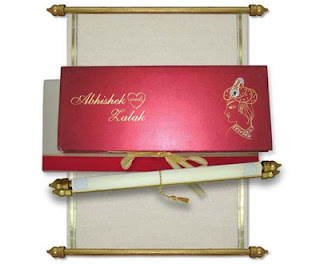 In my own starter marriage I ordered regal purple and gold wedding scroll invitations from India. My guests loved them. Special note: These beautiful invitations unexpectedly came scented with sandalwood. Be sure to get all of the details in writing if dealing with foreign vendors as you may have more miscommunication over the phone. 2. Multiple Ceremonies. With the bachelorette party, bridal shower, rehearsal dinner we have almost as many traditional ceremonies in the west as in Indian culture. If you want approximate the 3 day wedding that Katy Perry and Russell Brand had you may consider having all of these events back to back over a 3 or 4 day weekend. 3. Make an Entrance. Russell Brand most likely arrived at his Indian wedding to Katy Perry riding on an elephant. you can still make an entrance without this majestic jungle giant…. the giant being the elephant not Russell Brand of course. Come riding in on a horse, in a carriage or even a hayride depending on the theme of your wedding. If this is out of your budget you can borrow or rent a regal looking classic car for a Hollywood effect. 4. Henna – better than the permanent tattoos. Katy Perry had her hands and feet decorated with henna tattoos as is the Indian bridal tradition. If you want to honor each other with tattoos then I would recommend that you tattoo a verse or something that means something to you rather than getting each others names tattooed on. 5. Jewelry and Adornment. Indian parents collect bridal jewelry for their daughters for years. To get this effect without expense you may want to wear jewelry pieces from your loved ones. Ask your family members and closest friends to each share with you a meaningful piece. You don’t have to wear them all on the big day. You can wear mix the pieces and wear them over the course of events. 6. Entertainment. A fortune telling parrot was one of the fun things included in the Perr-Brand pre wedding ceremonies. You can hire a tarot or palm reader to amuse your guests. If all else fails ask your aunt who has the crazy dreams to help out. This is perfect as you want to increase family roles and involvement in the wedding — other than making them minions to your bridezilla self. 7. Exotic Location. Russell Brand and Katy Perry wed on an Indian Tiger Reserve. Find a comparable natural location at the Aquarium or your local zoo, park or botanical gardens. If all else fails you can approximate this wedding idea by including your pet doggie or kitty cat. I hope that this Indian wedding advice is useful to you and your beloved. Remember that your wedding is a celebration of your love. The rest is all just details. Namaste.